Calling for entries for the online exhibition project. You will receive materials to make a small book in which you can print, write, paint on, stitch, any media, plus a calico bag. No rules apply to the design, structure, or content of the book except that it must fit in the bag provided. Entry is open to national and international artists, no theme applies. Entry fee: $30.00 AUD (OVERSEAS ARTISTS: $35.00AUD) ( Internet transfer, paypal, cheque, money order) Includes materials to make a small book, a calico bag, advertising, postage of project, fee for online content and journal articles. There will be an online exhibition in November and the chance to have your work or story published in the December issue of the Australian Book Arts Journal. Email and website updates will be sent to all participants leading up to this date. RSVP your participation by the latest, April 15, 2011. Projects due: 5pm, August 15, 2011. The Matchbox Zine Project - No theme applies. Individuality encouraged! matchbox, postage, advertising, online exhibition, journal articles). 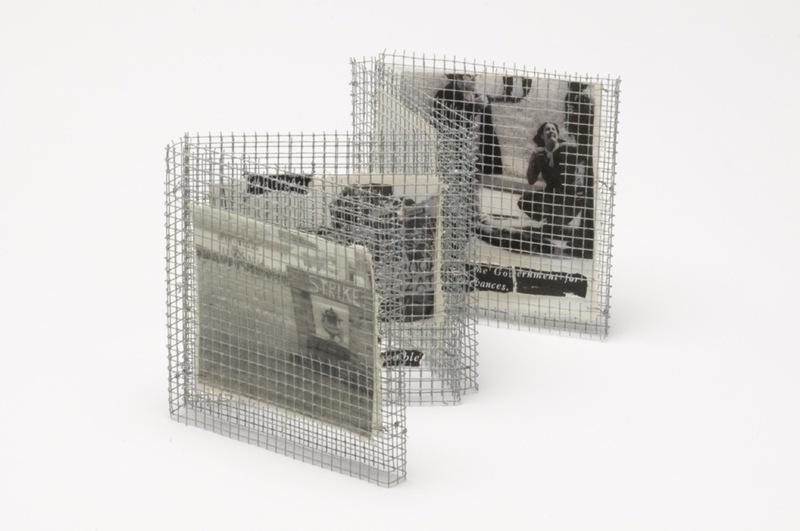 To coincide with the June Issue of IMPRINT, which is themed "Artists Books," The Print Council of Australia is encouraging its members and friends to produce zines in an enormous random zine exchange. A zine [short for magazine] is indeed a small "booklet," most often photocopied and stapled and can be filled with your writing-story, poetry, musings, and/or your drawing, doodling, photographs, and is quite ephemeral in its nature. It can be a personal story or factual observations, written or illustrative, the content is entirely up to you--the only requirement is in order to include the zine in the postage of Imprint, they need the zine to be small and lightweight. Be a part of our world-wide celebration of book arts--with over $8,000 in awards! The MCBA Prize is the first honor in the United States to recognize book art from across the field and around the world. Five finalists will be selected to each receive a $500 cash award, and up to $750 travel and lodging stipend to be honored at a gala celebration at MCBA's Book Art Biennial. From these five finalists, the jury will select the MCBA Prize winner and award them an additional $2,000 (total $2,500). All artists who use the book format are eligible, and all techniques and methods--from fine press works to inexpensive multiples, to installation or sculptural book work -- will be considered. Work must have been completed since August 1, 2009. Complete eligibility guidelines are available on MCBA's website. Deadline for entries is April 8, 2011. Submit your entry today! Are you interested in how PCB communicates all of the amazing events and opportunities available to you? Whether you're simply a fan of Facebook updates or a PR wizard, we are looking for volunteers to help in our marketing efforts. If you are interested or have questions, please contact Teresa at marketing@philadelphiacenterforthebook.org. & Zornitsa Stoyanova of Here[begin] Dance Co. Bodies of Text is a series of collaborative dance performances and art exhibitions tied to the book and its interdisciplinary interpretations. Premiering as a part of the 2011 Philadelphia International Festival of the Arts and its theme of Paris 1911, Bodies of Text is rooted in the idea of Art à la Rue and brings Art to the Street in Philadelphia's Rive Gauche, West Philadelphia. Philadelphia dance companies interpret seven unique books, selected from many submissions by PCB members. The first installment of these choreographic creations, all world premieres, will be performed on April 16th at the Community Education Center (3500 Lancaster) at 8 pm and will feature works by Idiosyncrazy Productions and Rain Ross Dance. Tickets are available through the CEC (Box Office: 215-387-1911) and through PIFA at http://pifa.org/events/980193157. Idiosyncrazy director Jumatatu Poe's new piece, A Big Enough Grief, is inspired by Lesley Mitchell's abstraction of AstorPiazzolla's song, Balada para un Loco, in her book of the same title. Mitchell's book has caused Jumatatu to reflect on his experiences with grief and the situations that create it. Composer Piazzolla's lyrics illustrate a man's obsessive love for a woman who is out of his reach. A Big Enough Grief examines the longing for those that are no longer within our reach. Shannon Murphy, also of Idiosyncrazy Productions, has created Blast Vs Blaze, an investigation of an argument that can never be won or lost. Inspired by Monica Kane's book Strike, and with sound and video work by Steve Surgalski, this dance theater duet explores the definitions that keep us separated, keep us fighting, and that keep us from communication. In the duet, Murphy and Jumatatu Poe combat in unlikely ways. Their movement, often explosive and aggressive forever flues their battle without ever coming to resolution. Blast Vs Blaze is not a comment on who is right or wrong or good or bad. It is more a question of how we fight for ourselves and who we fight against. Rain Ross Dance, in collaboration with book artist Mimi Shapiro, will premiere another duet, The Flight To Varennes. This choreographic work explores an unforeseen fantasy that could never be a reality, asking the question: does love fall into categories? Ross and dancer Lauren Kelly will perform this exciting and sensuous duet, with an original composition by Dan Roeder. Performances will be followed by a discussion between choreographers and book artists, examining the transformation from printed page to stage, and accompanied by storefront exhibits of artist books and related material. Featured books will also be on view alongside each performance. Book artists chosen for the May and September installments are: Ananda Connolly, Rebecca Kelly, Anna Mavromatis, Jude Robison, and Bonnie Whitfield. New Look, New Reasons to Join InLiquid! InLiquid is excited to announce the launch of a fresh, completely redesigned web site, coming very soon. InLiquid members have been enjoying our services for over 10 years. We are now reaching out to artists, designers and curators to give them the opportunity to be among the first on our new and improved website, which offers a number of enhancements. We are confident that the benefits of this new initiative will get you excited about becoming a member of InLiquid! Click here to learn more about these exciting features. Members & Friends Meeting - Wednesday @ HSP! Join us to enjoy HSP's Hidden Treasures, as selected by the Conservator, including illustrated notebooks, Pennsylvania Dutch Frakturs, a copy of the Star Spangled Banner written and signed by Francis Scott Key, Dard Hunter's Papermaking in America and more. Hear the story of Emma Emlen's ca. 1860 cookbook, soon to be published in facsimile by HSP.